Yanmar has over a century of experience designing and manufacturing diesel engines. For a Yanmar Industrial diesel solution, please contact us or use our OEM inquiry form, and a product specialist will help you get the right engine and kit for your application. Looking for Marine? 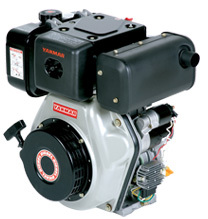 We proudly distribute Yanmar Marine engines - please see our Marine catalog here. Yanmar's single-cylinder, air-cooled direct injection diesel engines are EPA & CARB exhaust emission compliant, and utilize a counter-balancing system for smooth, high-speed operation. Multiple PTO shaft options are available along with electric or recoil starts. Two power levels are offered. Please see other Yanmar models available below.